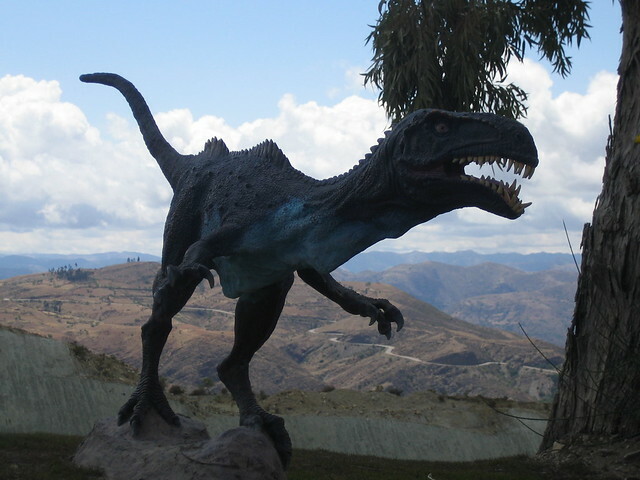 Located about 6 km outside of Sucre in the small mountain of Cal Orck’o is the world’s largest collection of dinosaur tracks. The Dino prints are scattered across a huge 100m high rock face covering 25,000 metres sq and are viewable from across the casm. Because the footprints are such a distance away it’s not exactly easy to make them out, its also hard to get any sense of scale maqking the prints a little disappointing. That said if you’ve some binoclulas a good imagination, and are into dinosaur’s you’ll most likely enjpy a visit. Its not far out of Sucre and reasonably priced so if your visiting Sucre anyway its definitely worth a visit. You can get thereby taking the red Dino-Truck that leaves daily from the Cathedral on Plaza 25 de Mayo at 8:30am, 9:30am, noon, 12:30pm, 2pm, and 2:30pm. The ride there costs about $1.50 (11Bs) and $3.50 (26Bs) to enter the park.